Based on newly emerged sources, including memoirs of Soviet veterans, Isabella Ginor and Gideon Remez challenge conventional concepts and expose the USSR's direct military clash with Israel in the 1960s and '70s. Detente notwithstanding, the Soviet intervention was massive, aggressive, continuous from the Arab defeat in the 1967 Six-Day War, and decisive in enabling Egypt's offensive in the 1973 Yom Kippur War. 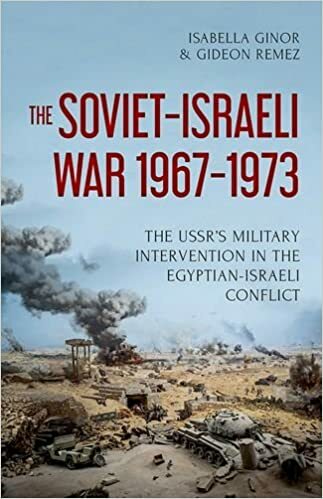 Along the way, the authors dispose of such widely held myths as "the Soviets' expulsion from Egypt in 1972" and show how present Russian action in the Middle East replicates the Soviet model. Isabella Ginor and Gideon Remez, both associate fellows of the Truman Institute, Hebrew University of Jerusalem, were formerly award-winning journalists – she as Soviet/Russian specialist at Haaretz, and he as head of foreign news for Israel Radio. Their previous book, Foxbats over Dimona (Yale, 2007) won the Silver Medal, Washington Institute for Near East Policy book prize and was named a book of the year by Foreign Affairs. Their innovative methodology and sources are described in a recent journal paper; the present-day relevancy of their research was highlighted this year in commentary and news-analysis articles. Before the event, see Ginor and Remez's post on the History and Public Policy Program's blog, Sources and Methods.